My interest in middle managers is inspired by the fact that they are the subject of numerous central conceptual questions, such as who they are, how they are different from other categories of managers or professionals, what they do and how their roles are affected by organisational restructuring. My research detected that middle management in Malta commonly concerns traditional professionals (e.g. accountants and engineers) and those carrying out new expert occupations (e.g. business, compliance, IT and risk specialists) who possess professional credentials and, in a number of cases, warrants. Some middle managers are generalist managers but these are not the typical ones. Indeed, in Malta it is common for general management functions not to be separated from specialist expert functions. This reality of middle managers in Malta shares some similarities with their counterparts in Germany and Italy. In their role, middle managers in Malta make use of their technical/specialist expertise. Besides managing subordinate employees, other responsibilities integrated into the managerial role include being directly involved in leading technical tasks and handling exceptions; providing specialist support; and seeking solutions to technical problems. While our economy is continually shifting towards a post-industrial service driven kind, which relies heavily upon high level of expertise, organisations are constantly on the lookout to reorganise as a way to safeguard and possible prosper their existence. In a small island like Malta, where human resource is its greatest asset, the quality of this resource is a defining feature of business competitiveness. 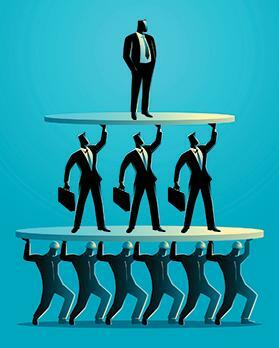 As a result, those who occupy the middle managerial levels, even if they continue to occupy a fairly ambiguous status as agents of capital subordinated in an organisational hierarchy, are securing their employability by means of the professional expertise they hold. The professional expertise they possess, expressed in a combination of knowledge, skills and experience is increasing becoming a prominent social attribute upon which they secure their employment, status and social prestige. Middle managers in Malta are not necessarily equipped with sufficient and adequate resources to conduct generic managerial functions. Concurrently, following organisational restructuring, certain boundaries created by bureaucracy, including the centralisation of strategic decision-making, continue to persist. Contrastingly, at a time when work organisations are becoming more complex, the middle managers are increasingly responsible for the effective running of unit operations and output. They are held accountable for the detailed planning, monitoring and execution of technical and operational activities, which they handle directly by managing subordinate employees. These responsibilities, which middle managers execute on account of their professional expertise, are key because they are the means by which they establish and maintain a particular relationship with their superiors and thereby safeguard their managerial position. Leverage over the technical coordination of work within the organisation’s specialised units is used in the social coordination and control that the middle managers require to carry out their role. Essentially, the professional expertise middle managers develop is both a technical and social resource. It served middle managers as a technical resource, because they required particular knowledge and specific skills to provide operational control, technical expertise and specialist support. With respect to professional expertise as a social resource, there is an element whereby it is socially constructed. In other words, since professional expertise is regarded as a high-quality ability key for the organisation to operate effectively and efficiently, middle managers use it to attain power and to defend their hierarchical position. The element of social construction is leveraged in intra-organisational struggles that middle managers lead, given that they use professional expertise to draw boundaries, uphold their standing and preserve their autonomy. Ultimately, the technical aspect and the social aspect are interlinked because they provided middle managers with a substantial degree of autonomy and a high standing, as seen by the employees they manage and the top managers who manage them. Rebecca Gatt’s PhD research was partly funded by the Malta Government Scholarship Scheme.